Koufonissi passenger and car ferry ticket prices, timetables, ticket reservations and information for ferries sailing from Koufonissi to Amorgos, Katapola, Folegandros, Iraklia, Milos, Mykonos, Naxos, Paros, Piraeus, Piraeus, Santorini and Schinoussa. Compare all available Koufonissi ferry ticket prices in real time and book the cheapest available Koufonissi car and passenger ferry tickets sailing to and from Koufonissi, Amorgos, Katapola, Folegandros, Iraklia, Milos, Mykonos, Naxos, Paros, Piraeus, Piraeus, Santorini and Schinoussa with Blue Star Ferries or Sea Jets ferries online with instant confirmation. Book Koufonissi Ferry Tickets with Blue Star Ferries or Sea Jets for ferries sailing from Koufonissi to Amorgos, Katapola, Folegandros, Iraklia, Milos, Mykonos, Naxos, Paros, Piraeus, Piraeus, Santorini and Schinoussa online in advance to enjoy the cheapest available ferry ticket price. The price you see is the price you pay. There are no hidden extras or surprises such as added fuel surcharges or booking fees and we do not charge you anything extra for paying with a Visa Electron card. The price we quote you for your selected Koufonissi passenger or car ferry ticket, onboard accommodation and vehicle type is all you will pay, and that's a promise. To obtain a Koufonissi ferry ticket price and book your ferry ticket securely online please use the real time ferry booking form on the left. You are also able to add a hotel at your destination, or anywhere else, to your ferry ticket when completing your ferry ticket reservation. Koufonissi island is located in a beautiful spot in the Cyclades between Amorgos and Naxos. The beaches are a beatiful blue-green color that will amaze any tourist. On Koufonissi there are many places that will tingle your taste buds, feast your eyes, and maybe get you a little wet. Koufonissi island has been a tourist favorite since the late 1990's. Koufonissi is a place for silence and comfort and on Koufonissia.net we hand pick only the best places on Koufonissi island for your accommodation, restaurants that make you want more and bars that serve you the best. Chora is the only village on the island, and here there are pretty little churches, an art gallery and a few shops. Apart from that, there is not much to see, except the beautiful surroundings. Koufonissi has some of the best beaches of the Greek islands. The are sandy and great for families with children, since they are shelving and calm. The island is tiny, so just take a walk and find your own spot. Many thing the lagoon Pori is the most beautiful place. Nudists go to the area after Charokopou. There is also a boat that goes to some smaller islands with excellent beaches outside Koufonissi. There are a couple of places in Chora, but don't expect any wild nights. Here, you just have a cold drink, enjoy some good music and the surroundings. There are a few souvenir shops in Chora, as well as an art gallery where you can get handpainted t-shirts and paintings. There are also a few shops with antiques and miscellaneous things, useful and not. Walking! There are no cars or mopeds for rent, and no local bus, but the island is tiny and almost flat, so getting around by foot is no problem. Koufonissi is separated from the rest of Crete by a narrow strip of sea, but it’s often rough here, so boat trips may be cancelled unless the weather is really fine. Koufonissi is one of a group of five small desert islands (the others are Makroulo, Stroggylo, Trachila and Marmara), a handful of land in the sea, often collectively called Koufonissia. Along with Gavdos and Chryssi, these are the southernmost pieces of Greek soil, the southernmost frontiers of Europe. The ancient island of Lefki was an important shipping port thanks to its ideal location for shell- and sponge-fishing, and is thought to have played a major role in the Minoan economy. Inscribed plaques found at Zakros and Magnesia in Asia Minor record conflicts between the cities of Itanos and Ierapytna (ancient Ierapetra) over the ownership of Lefki. One of these plaques is found in the façade of the monastery church at Toplou. The dispute ended in 132 AD, when Lefki was ceded to Itanos, to which it historically belonged. In 1976, archaeologist Nikos Papadakis excavated the island for the first time. The whole island is strewn with Hellenistic and Roman ruins. The most impressive find is a theatre, discovered with its stage and hyposcenium, as well as fragments of wall plaster. The ancient theatre at Koufonissi Coins and pottery have also been found here. Houses have been excavated 200 m from the theatre, indicating that there was a simple settlement here: needles, seashells and fishing equipment show that it was probably a fishing port. However, the discovery of murex shells shows that porphyry, an extremely valuable purple dye, was also produced here. At the south end of Lefki Island were found parts of an ancient temple and pieces of marble from some colossal statue which gazed out over the Libyan Sea. At the west end of the island there are caves and hollows which were used as chapels in the Byzantine period, and in which inscriptions and engravings of saints are preserved. Best Price Guarantee - We always offer you our lowest available Blue Star Ferries or Sea Jets passenger and car ferries ticket price to and from Koufonissi. There are no hidden extras or surprises such as added fuel surcharges or booking fees and we also we do not charge you anything extra for paying with a Visa Electron card. The price we quote for your selected Koufonissi ferry ticket, onboard accommodation and vehicle type is all you will pay, and that's a promise! In the unlikely event you find the same all inclusive Koufonissi ferry ticket cheaper in the brochure of any other tour operator we promise that we will do our best to beat that price or offer you the choice of requesting a refund. 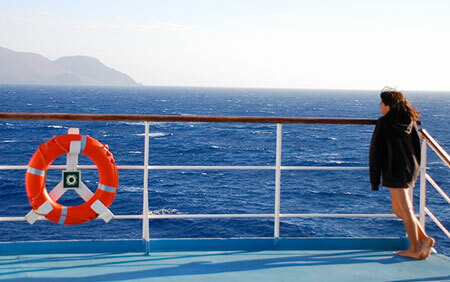 To book Koufonissi car and passenger ferry tickets please click here. At ferryto.com you are able to obtain live Koufonissi ferry ticket prices, check availability and book car and passenger ferry tickets to and from Koufonissi at our lowest available ticket price. Ferryto.com is part of the world's largest online ferry ticket distribution network providing the ability to book over 80 major European ferry operators including to Koufonissi and to over 1,200 other ferry routes throughout the UK, France, Spain, Ireland, Holland, Eastern Europe, the Mediterranean, the Baltic and North Africa.